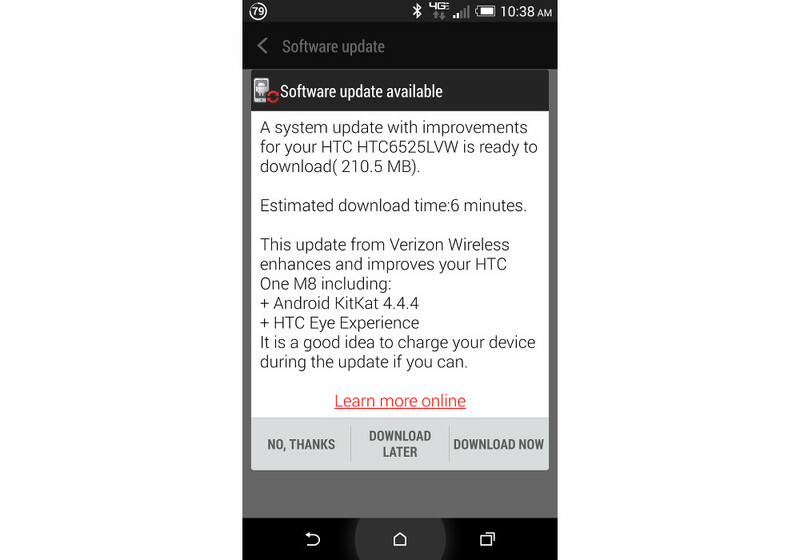 The HTC One (M8) on Verizon is receiving its EYE Experience update right now, according to at least two of our readers. HTC was expecting the push to happen today, so it appears as if Verizon came through on their end. The update, for those new to the EYE Experience, introduces better face tracking of multiple people in a room, screen sharing, Split Capture feature (combination of simultaneous photos and videos taken with both cameras), Crop-Me-In mode (ignore this one), Voice Selfie (selfie explanatory), and more. To check for the update, head into Settings>Phone update>Check for update. The update is 210.5MB in size. It’s not just about the hardware though. The HTC EYE Experience takes mobile imaging software into a new league with unique features guaranteed to make you look your best. Taking video chat and conference calls to a new level of quality and performance, The HTC EYE Experience’s face tracking keeps you perfectly framed at all times. And because staying in touch means more than just talking to a single person, up to four people in the same room can also be tracked comfortably, with each face cropped and positioned on the screen for maximum clarity. So enjoy the freedom and flexibility of services like Skype without worrying about exactly where you or your friends are standing, as the camera will follow everyone. Want to share even more on the move? The option of screen sharing brings desktop functionality to smartphone-based video chat for the first time. The HTC EYE Experience opens up a new world of creative opportunity, thanks to the new Split Capture function. Combining simultaneous photos and videos taken on the front and back cameras into one split-screen image or video, this creates a new selfie experience, allowing you document your journey and your reaction without relying on thumbnail views. Crop-Me-In places you at the heart of the action by cropping you from the image or video taken with the front-facing camera and positioning it within the scene captured by the main camera, opening the door to more extreme, exciting selfies and videos. Voice Selfie removes the need for awkward hand contortions by enabling you to trigger the shutter release with a simple command. Simply “say cheese” as soon as you’ve struck the perfect pose or trigger the video recording with “action” or “rolling” commands. Popular additions to the HTC Desire 820 are also included in the HTC EYE Experience such as face fusion, the feature that allows you to merge your face with that of a friend or celebrity for a completely original look and Live Makeup, where you can set the desired level of skin smoothing and preview the effect in real-time before the image is captured.